If you have an ulcer, chronic gastritis or gastroesophageal reflux disease or have recently had a surgery on your digestive tract, your doctor may place you on a bland diet. On this diet, you'll need to avoid all foods that are spicy, highly seasoned, high in fiber or difficult to digest. You may need to alter some of your normal eating and cooking habits to do so. Ask your doctor or a dietitian for help developing a bland diet plan that provides you with all the nutrients you need. For breakfast on a bland diet, try pairing scrambled eggs or egg substitute with cooked cream of wheat, suggests Gastroenterology Consultants. Although the U.S. Department of Agriculture advises that half of all the grains a healthy adult eats should be whole, you'll need to avoid whole-grain bread, cereals and pasta in favor of refined cereals, white bread and regular pasta while you are on a bland diet. Round out your meal with orange juice, low- or nonfat milk and a piece of white toast. A meal of roasted lean beef, chicken or turkey paired with gravy, white rice, cooked carrots, canned pears and a salad of iceberg lettuce could serve as lunch while you're following a bland diet. Bake, broil, boil, roast, stew or microwave meat and poultry instead of frying and steer clear of cured or smoked products, including sausages, corned beef, hot dogs, ham and cold cuts. Add flavor with herbs and mild spices, but don't use garlic, pepper, chili sauces, barbecue sauce or horseradish. Substitute steamed or baked tofu for the meat if you're a vegan or vegetarian. 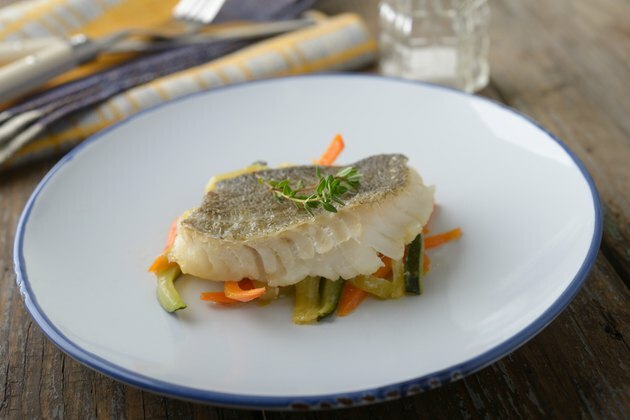 Prepare baked fish, regular noodles, cooked vegetables like zucchini, green beans, asparagus, spinach or summer or winter squash and milk for dinner on a typical bland diet plan. All the vegetables you consume while on a bland diet need to be baked, boiled, mashed or steamed, not raw. In addition, avoid dried beans and legumes, corn and vegetables that are more likely to cause gas, including brussels sprouts, cabbage, broccoli, onions and green peppers. When you have time, bake plain, low-sugar cookies, cakes or muffins so that you'll have them on hand when you crave a snack or a dessert after dinner. Don't add nuts, fresh or dried fruit or shredded coconut to the batter to keep the fiber content as low as possible, and always use enriched white flour, not any form of whole-wheat flour. Sugar-free pudding made with low-fat milk is another option. For fewer calories, choose canned or cooked fruit. While you can eat ripe bananas and avocados raw, all other raw fruits should be avoided.